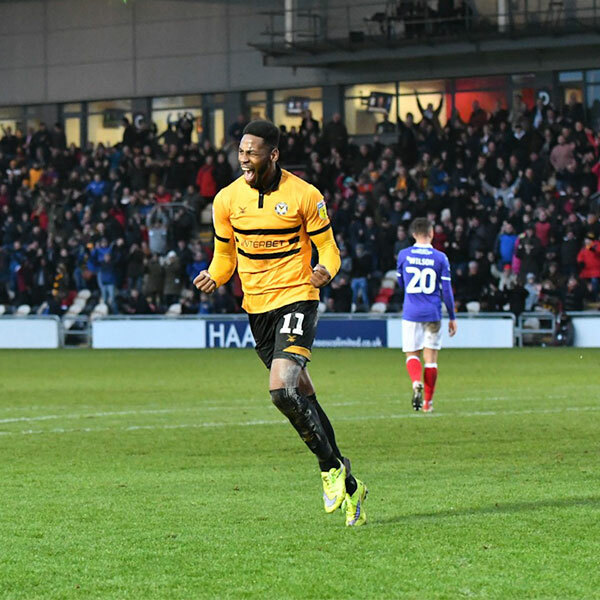 A University of Wolverhampton graduate is using his psychology degree to achieve his goal of FA Cup success with giant killers Newport County AFC. Striker Jamille Matt is currently preparing for his League Two team’s FA Cup fourth round tie against Middlesbrough on Saturday (26 Jan 2019). He will be hoping to emulate the success of the previous round which saw the South Wales club defeat former Premier League champions Leicester City. Jamille graduated from the University of Wolverhampton with a BSc (Hons) in Counselling Psychology in 2011, and is using the skills he learned while he was studying to prepare for the big games. The 29-year-old says: “Professional football is a very pressured environment and you can become very stressed based on results, injuries and the performance levels of ourselves. So in the difficult times I find I use what I learned in Counselling Psychology to speak to my teammates and empathise with them if they are maybe not feeling very confident. Similarly when they are confident and playing very well, I try to help keep them feeling that way as it benefits the whole team. Speaking about the next game against Championship team Middlesbrough, Jamille says: “There are a couple things I will use to prepare for the next FA Cup game against Middlesbrough which I use for every game I play. I will make sure I’m in a positive mindset going into the game. This will include making sure that even though Middlesbrough are two leagues above Newport in the football pyramid, we have to go with the belief that there is a level playing field so that we can achieve a positive outcome. Jamille, who began his career Sutton Coldfield Town before moving to Kidderminster Harriers in 2010, says his future aspirations are to use his Counselling Psychology degree in conjunction with his football career. “I feel I would be able to help others with my experience playing as a professional and be able to relate to some of the pressures that come with playing at a professional level,” he explains.